For years, Lando Calrissian has made his living on the fringes of civilization. He’s been a smuggler and a gambler, trusting his fortunes to Lady Luck—and somehow coming out ahead time and again. Most recently, his victory in a card game won him control of Cloud City itself: a luxurious resort and tibanna gas mining facility. Though Lando may be more “respectable” as the Baron Administrator of Cloud City, he’s still a scoundrel at heart, and more than willing to help the Rebellion in their fight against the Imperial Security Bureau. 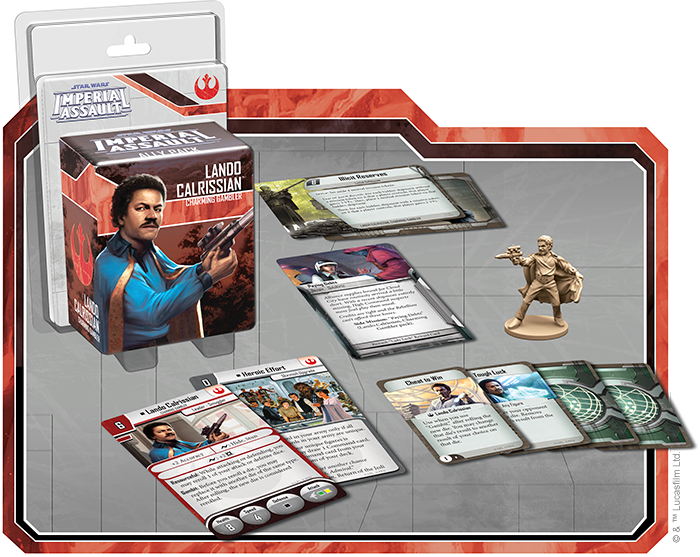 Bring Lando Calrissian himself into your games of Imperial Assault with the Lando Calrissian Ally Pack! Like other figure packs, this expansion offers a beautifully sculpted plastic figure that can be used to replace the token found in The Bespin Gambit expansion. 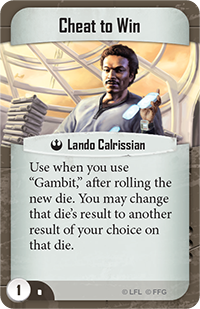 Furthermore, new Deployment cards, Command cards, and missions for campaign and skirmish make Lando Calrissian a vital ally for the Rebellion. Today, you can travel to Cloud City yourself as we explore the new tactics unlocked by the Lando Calrissian Ally Pack! Lando Calrissian may come to your aid in a campaign or skirmish, and you can be certain that he’s ready to fight for the Rebel Alliance. You’ll immediately notice that Lando Calrissian features two powerful surge abilities. He can spend a surge to add two damage to his attack or to immediately gain the Hidden condition and inflict the Stunned condition! When you add those surge abilities to his constant accuracy boost, it’s clear that Lando shouldn’t be underestimated in a firefight. Ultimately, though, what defines Lando Calrissian is his ability to cheat the odds and get the results he needs. This is reflected by two abilities on his Deployment card. The first ability, Resourceful, allows you to reroll one of your attack or defense dice while attacking or defending. Rerolling your dice is extremely powerful, and Lando offers a dizzying amount of rerolls, since he can use Resourceful every single time he attacks or defends. Lando's second ability gives you another way to cheat the system. By using Gambit before you reroll a die, you may instead swap that die out for another die. Though swapping in a new die takes the place of your reroll, this ability still gives you unparalleled control over your attacks and defense. 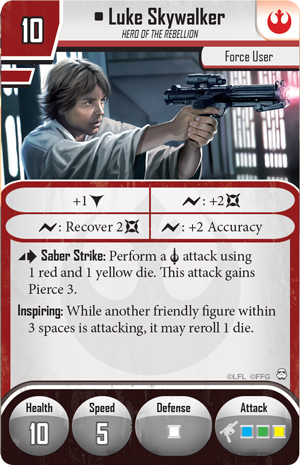 You may swap Lando’s yellow attack die for a red attack die if you want to deal more close-range damage, or you may replace your black defense die with a white die if only a dodge would prevent you from being defeated. No matter how you use his abilities, Lando loves to give Lady Luck a bit of help. For your Imperial Assault campaigns, Lando Calrissian can be a very useful ally—in fact, he’s nearly like an additional hero in many ways. He can hit hard and press the attack if needed, or he can help you move towards your mission objective without delay. Throughout The Bespin Gambit mini-campaign, you’ll be able to take advantage of Lando’s unique talents, but you can also bring him into play with the Paying Debts side mission from the Lando Calrissian Ally Pack. Successfully completing this side mission doesn’t let you call on Lando’s help whenever you want, but it does offer you a very useful Reward card: Lady Luck . 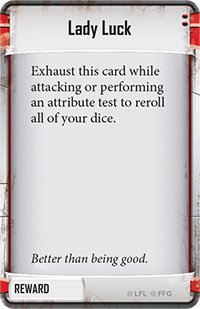 This Reward can be exhausted whenever you attack or perform an attribute test in order to reroll all of your dice! 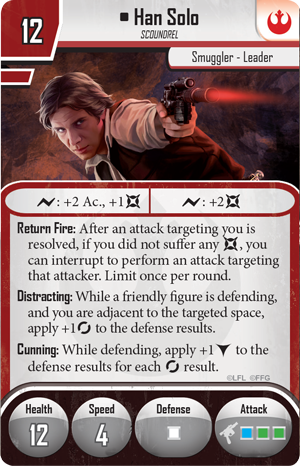 We’ve seen above that Lando’s penchant for rerolling dice can turn the tide of battle in your favor, and with Lady Luck on your side, you can take another shot at a muffed attack or attribute test. 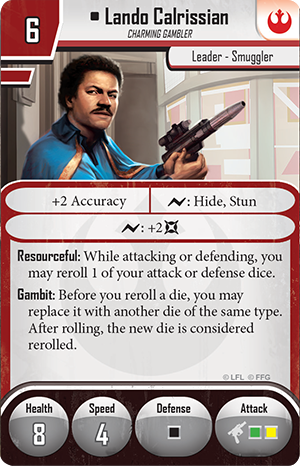 Lando Calrissian is also a force to be reckoned with during your skirmish games. For only six points, Lando can help fill out any strike team with a reliable figure. His rerolls make his attacks and defense even more dangerous, and if you pair him with Luke Skywalker , you have a much better chance of getting exactly the results you need from any attack. The Lando Calrissian Ally Pack also includes a new skirmish upgrade that supports a particular type of Rebel strike team. Heroic Effort is a free skirmish upgrade, but you can only take this upgrade if all of your army’s Deployment cards are unique. Of course, if you’ve built your strike team around Rebel heroes like Luke Skywalker, Leia Organa , Han Solo , and Lando Calrissian, this should be little problem. 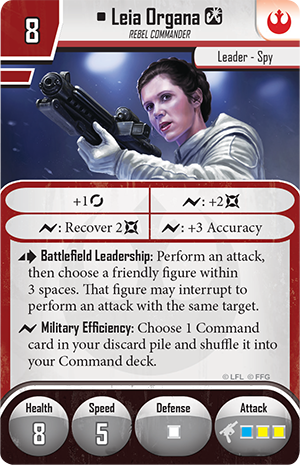 Though you’ll typically have fewer figures than your opponent, Heroic Effort rewards you with increased access to your Command cards. Whenever one of your unique figures is defeated, Heroic Effort invites you to draw a Command card and add a Command card from your hand to the bottom of your deck, helping you to find the Command cards you need exactly when you need them. 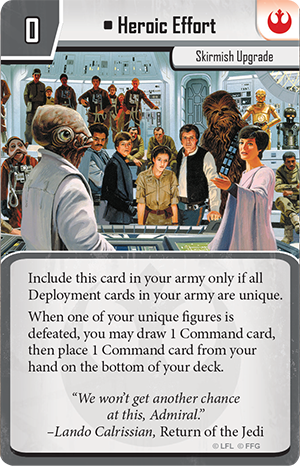 Speaking of Command cards, you’ll find four new Command cards in this figure pack, and many of them interact directly with other Command cards. 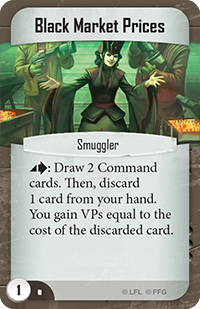 For instance, you may take advantage of Black Market Prices to immediately draw two Command cards. Then, you must discard one card, but as an added bonus, you gain a number of victory points equal to the cost of the discarded card. On the other hand, you may try to keep your opponent from gaining the upper hand with Stall for Time . 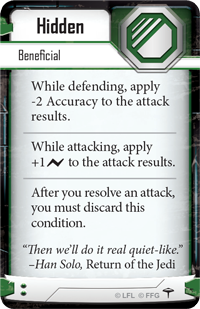 This Command card is used at the start of the round, and it forces your opponent to place a random Command card from his hand back on top of his Command deck—potentially forcing him to delay using a powerful effect. 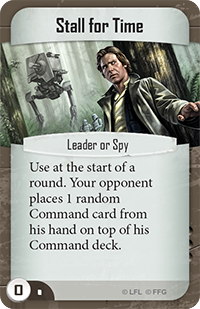 You might even deliberately remove the element of luck with Lando Calrissian’s personal Command card, Cheat to Win . You can play this Command card after you use the Gambit ability to swap one die for a different die. After you reroll the new die, you can change the result to any other result on the die—guaranteeing you get what you need, whether that’s a dodge or just a few extra points of damage. Lando Calrissian has always been a scoundrel, but with the Lando Calrissian Ally Pack, he’s your ally as well. 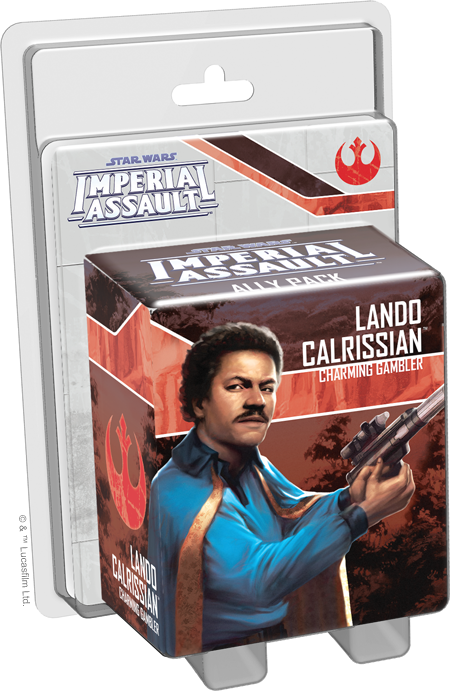 Pre-order your copy of the Lando Calrissian Ally Pack at your local retailer today, and look for our next preview soon!